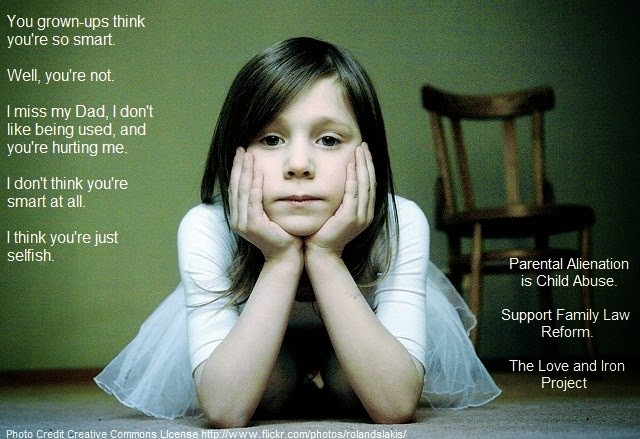 Help the Fight - America we need to stop the One-Parent Fight arising in this Country. 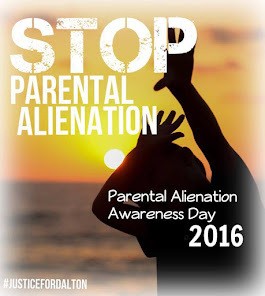 Our Children are being destroyed because of Parents Rights being Neglected and Parent Alienation. Do your Part Unite and Write!!!! Print and Send to as many Government Offices and State Representatives as you can and keep us informed on your quest. 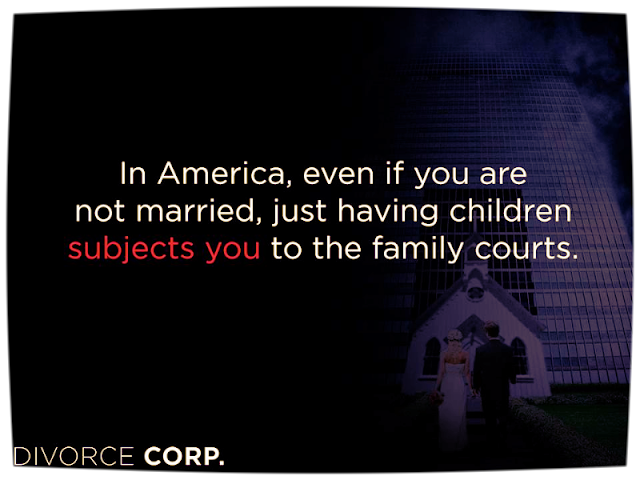 We need to repair "Family Values". Just because parents are not together does not mean they can not work together! I am writing to you to demand change on an epidemic that is destroying families, fathers, and children right here in Country. Simply put, the Family Court system as it now exists has stripped fathers of their rights to be a part of their children's lives. Instead, fathers have turned into financial pumps, living in constant fear of being dragged back into court by their ex-wives and victimized yet again. I could give you countless examples of fathers who have been victimized. Im not referring to the deadbeat dad types who leave their ex-wives and children living in the streets. I am talking about hard working, tax paying, child-loving fathers who live for their children. The ones who had their children stripped from them for the simple reason of their ex-wife deciding that she just no longer wanted to be married. The ones who are allowed to see their children for 4 days a month. The ones who are allowed to see their children for a few weeks over the summer. The ones who are required to pay astronomical amounts of child support, often putting themselves in a situation where they barely can afford to live. These are the fathers that are relying on the judges, lawyers, and Legislators to help reform the system. 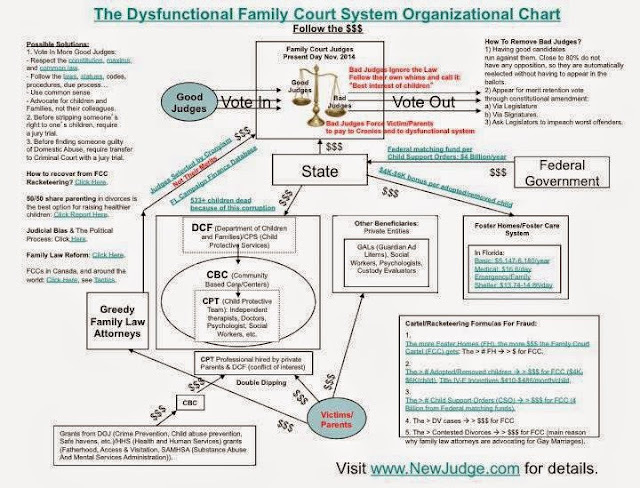 This system has created a society of fatherless children and childless fathers. This system has created its own life through a judicial system that exists on misery to feed itself. 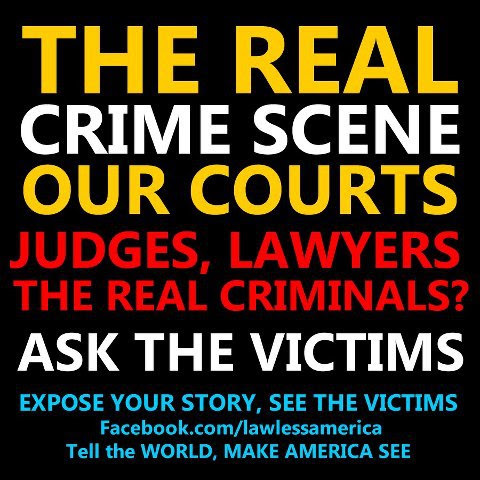 This system violates their Constitutional Rights to Due process, Equal Protection under the Laws, and Privacy. I would like to call your attention to the February 25th, 2002 ruling by C. Dane Perkins, Superior Court Judge of the Georgia Alapaha Judicial Circuit. 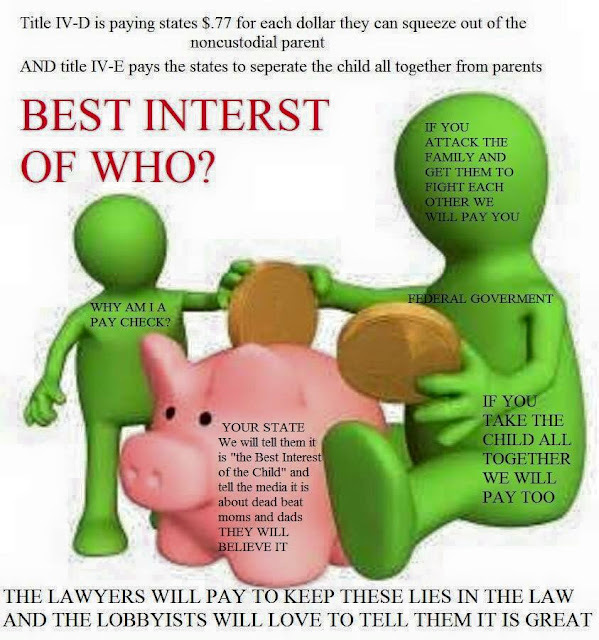 Judge Perkins declared the Georgia Child Support Guidelines (which were adopted guidelines from Wisconsin which almost all states use) void and unconstitutional in his ruling based on the above Constitutional Violations. 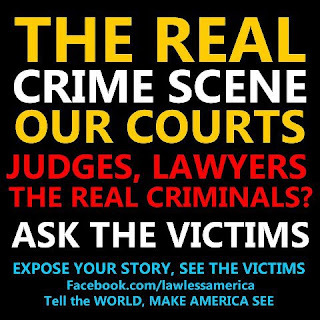 Due Process The United States Constitution provides that NO State may deprive any person of life, liberty or poverty without due process of law. In almost all states, presumptive child support awards rise as a share of obligor (paying parent) income. NO child cost studies show child costs rising as a share of after-tax income. ALL child cost studies show child costs declining as a share of the after-tax income. In most cases, especially in higher income situations, the presumptive child support results in a significantly higher obligation than one bases on actual child costs that decline as a share of net income. In Parrett v. Parrett (1988, the Court of Appeals of Wisconsin), the court found that, particularly in higher income situations, the presumptive child support amount would result in a figure so far beyond the child’s needs as to be irrational. This is the very sort of result the Due Process clauses are designed to prevent. Equal Protection The United States Constitution provides that NO State may deny to any person within its jurisdiction the equal protection of the laws. 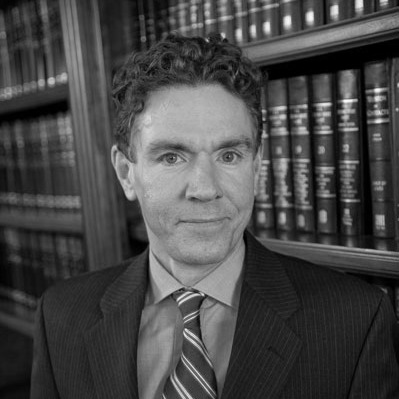 The court found that the egregiously different burdens placed on persons similarly situated but for the award of custody, i.e., parents with the obligation to support their child(ren) and the same means for doing so as when they were married violates the guarantees of equal protection. Finding of Fact in the ruling further address this issue. Tax Benefits The court points out that custodial parents typically receive $200 to $350 per month in extra after-tax income just for having custody. These child-related tax benefits include Head of Household status, Child exemptions, child credits, childcare credits, and Earned Income credits. Wisconsin either does not include these credits in child support calculations or they are grossly understated. The court found that not sharing these child-related tax benefits violates equal protection. Financial Windfall The presumptive child care award typically results in the custodial parent receiving huge financial windfall (profit) well in excess of childcare costs. For typical income situations, the custodial parent ends up with a higher standard of living than the non-custodial parent. This is the case even when the non-custodial parent earns significantly more than the custodial parent. This represents an extraordinary benefit for the custodial parent and an extraordinary burden for the obligator. This violates equal protection. In addition, when combined with the tax benefits discussed above, the outcome is that the custodial parent does not contribute to the child costs at the same rate the non-custodial parent and, often, not at all. Hidden Alimony The court found that, in essence, the child support obligation amounted to hidden alimony. These hidden alimony amounts were so excessive that a non-custodial parent is oftentimes unable to provide for the child (ren) when in the non-custodial parents care to the same extent as in the custodial parents household. Presumptive awards have been shown to typically exceed total actual costs according to the U.S. Department of Agriculture. 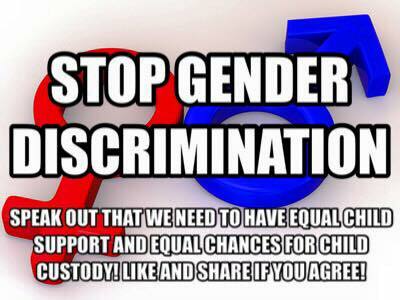 This violates equal protection standards for both the child and the non-custodial parent. In addition, this bias towards hidden alimony exists even when the custodial parent earns substantially higher income than the non-custodial parent. Low Income below Poverty Line The presumptive award for low-income obligors (minimum wage workers) pushes them below the poverty line. An award that leaves the obligator with less income than needed for basic needs creates an extraordinary burden. This violates equal protection. The source of the right to privacy has been held to originate in varying constitutional provisions. However, it has been long recognized to apply to family concerns whether the family exists within the confines of marriage or not. (Eisenstadt v. Baird (1973)). The court found that by requiring the non-custodial parent to pay an amount in excess of those required to meet the child(rens) basic needs...(the child support amount) impermissible interfere(s) with parental decisions regarding financial expenditures on children. The government’s interest in family expenditures on children is limited to insuring that the child(rens) basic needs are met. Not extravagances, not luxuries, but needs. 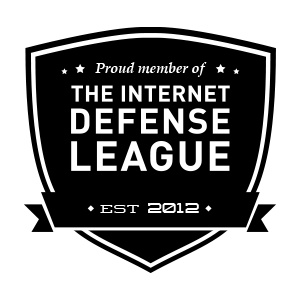 Once that occurs, government intrusion must cease (Moylan v. Moylan). In addition, the court found that the presumptive child support is so excessive that it forces non-custodial parents to frequently work extra jobs for basic needs. This creates an extraordinary burden for the obligor and, potentially, an additional burden on taxpayers. It is also distracting the non-custodial parent from parenting fully without justification. This violates equal protection. This is contrary both to public policy and common sense. Any government mandate beyond basic child costs interferes with the right to privacy. The Guidelines do not take into account the custodial parents income. The presumptive child support awards do not vary with family income--only obligor income. The custodial parent is not held to the same standard for contributing to child costs. In most cases, the custodial parents obligation of support ends up being largely or entirely paid by the non-custodial parent. The custodial parents income has no bearing on the amount of child support the non-custodial parent is ordered to pay. There is no formula in place that can determine how the custodial parents income affects the presumptive award. This is not economically rational and violates equal protection. Child costs of only the custodial parent are covered by the Guidelines. Costs incurred when the child(ren) is in the non-custodial parents care i.e. housing, food, clothing, entertainment and other needs for the child(ren) do not receive similar consideration. Yet, parents are similarly situated when child(ren) costs are incurred by either parent. Each parent has an equal duty to provide financially for the child(ren) when in the care of the other parent. These Guidelines where based on welfare situations in which the obligor parent was absent, and the custodial parent did not work and had no earned income, and did not take into account the custodial parent receiving large child- related tax benefits, and did not take into account the obligor paying substantial income taxes. However, in actual practice, typically the non-custodial parent is not absent and incurs substantial child costs that the Guidelines do not require the custodial parent to contribute. This violates equal protection and does not meet the financial needs of the child(ren) when they are in the care of the non-custodial parent. The Guidelines do not require that the custodial parent share in the costs of the non-custodial parent. The Guideline criteria for deviation do not give any guidance on how to apply the deviations in a consistent manner. This is unconstitutionally vague and generally results in no deviations in most cases, even when the circumstances to deviate exist. We need to do more to make sure both parents are fully involved in the raising of their children, particularly fathers - Wisconsin Governor Tommy Thompson October 22nd, 1999- Right here in our country, our homeland where we feel justified in wanting to raise our Child(ren) are we being stripped of our Constitutional Rights. We, as parents have a fundamental right to assume equal periods of placement of our children, unless there is credible evidence that a parent is not fit, that placement would be harmful to the child(ren). This right is fundamental; not that one parent must win as a result of lengthy, intrusive and costly legal battle, or compromised simply to reach a stipulated agreement to avoid a battle. 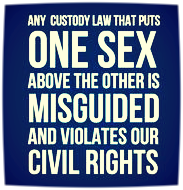 The Due Process and Equal protection provision of the 14th amendment of the United States Constitution suggest the fundamental rights of both parents must be treated equally. It also points out the constitution and the laws of the United States..... Shall be the supreme law of the land; and that judges in every state shall be bound thereby, anything in the constitution or laws of any state to the contrary notwithstanding. The courts responsibility to support these fundamental rights are further established; Every person Elected or appointed justice of the supreme court, judge of the court of appeals, judge of the circuit court or municipal judge, shall take, subscribe and file the following oath: I,.... Do solemnly swear that I will support the constitution of the United States and the constitution of the state of..... 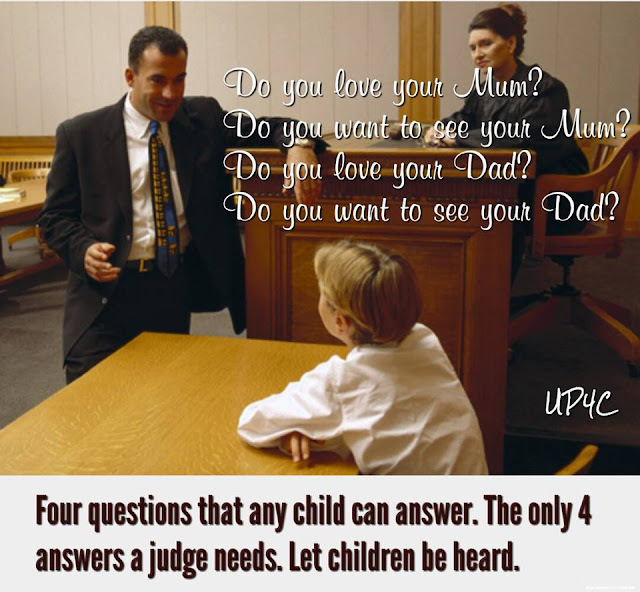 In practice, partly due to historical societal roles of parents and statistics on court rulings, there is an unwritten presumption that the mother gets custody and primary placement of the children and the father pays child support to the mother. While this presumption is not defined anywhere in the statutes, and is contrary to equality and the equal protection provision of the 14th amendment, it is very real. The net result is that the legal process treats a mother as innocent until proven guilty, and a father guilty until proven innocent. In light of this presumption, in cases involving two fit parents, the equal fundamental rights of the mother is usually fully supported, while the equal fundamental right of the father is subject to negotiation and compromise. As in many cases, fathers who merely want to fulfill their responsibilities to the child(ren) by providing for their care during equal periods of placement are often forced to accept 20-40\% placement or endure a lengthy, intrusive and costly legal battle. 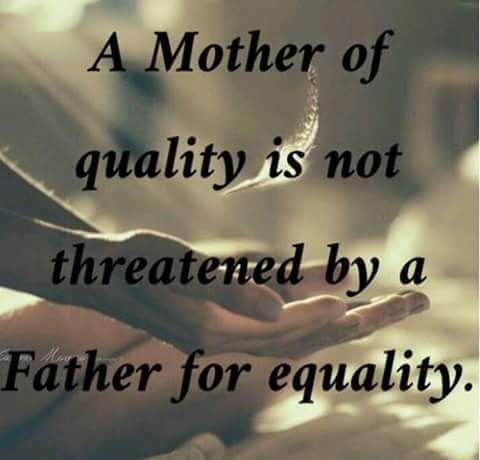 This violates the civil rights of those fathers who are encouraged, coerced or threatened to agree to stipulated agreements that deny them equal periods of placement against their will and denies the children the opportunity to an equally important relationship with their father. We are relying on our Courts to stop this egregious violation of Constitutional Rights and start giving us our rights back. We are relying on the courageous lawmakers to address this epidemic and stop the further deterioration of fathers, families, and children. Any Court, Any Judge, Any Attorney, Any Parent who rules or strives to keep a child out of the lives of both of their fit and willing parents should be considered a child abuser. 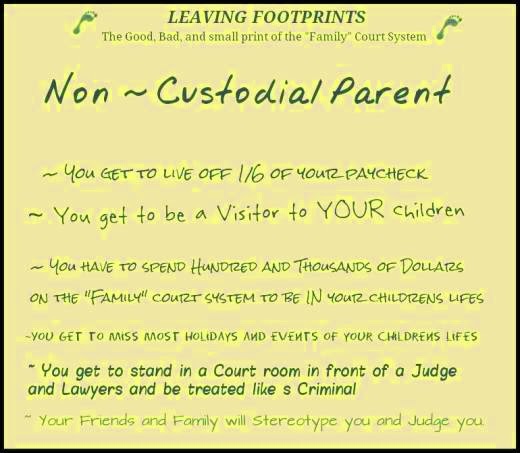 I am a Non-Custodial parent and I am the mother. I stand in total agreement that our children need and deserve to have BOTH parents in their lives. (Unless of course there is any sort of danger to the child from one parent or the other, then arrangements need to be made to keep that child safe from harm.) I have been fighting against PA since 2006 and just recently have had my 12 year son back in my life. Even now I still feel the pangs of PA because of the Custodial parent. He calls every week threatening to send our son away if I don't come get him. (Our son has ADHD and has violent episodes, which the father blames solely on me.) The last time we went to court the Judge more or less told me and my son (who spoke to the Judge in chambers, expressing his desire to come live with me because "My mom loves and takes of me, she takes time to be with me and do things with me" these are my son's words, spoken and written in a letter to the Judge), Also proving that the Custodial parent was unstable, being that he had been evicted from 3 different places in less than a years time, due to non-payment of rent, moving from state to state , while our son was sleeping on floors, in vehicles or the same bed with his father and whatever women he brought back to where ever they were staying at the time. While I own my own home, work full-time and our son has his own room, with his own bed in my home. The Judge said that I did not have sufficient evidence and dismissed my Modification of Child Custody. So now back at square one with the Custodial parent taunting me and our son, threatening to send him away if I don't come get him. 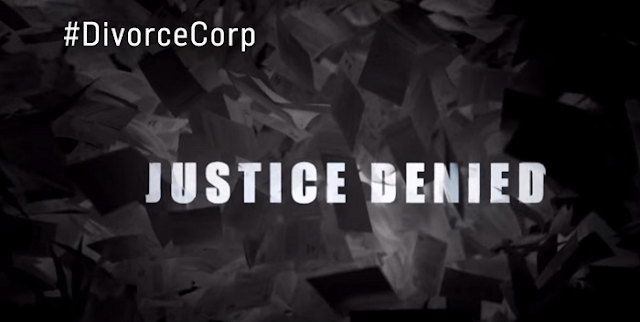 Even lawyers that I have spoke with are baffled by this Judges dismissal of my case. So now I start all over again filing Motions, gathering witnesses, so forth and so on. The only thing that has changed is the fact I am no longer fighting in the original county where this all started back in 2006. I can say thank you to the Judge for dismissing my case for that ray of hope in this bleak situation.